This stunning design is a lovely way to send your Season's Greetings this Christmas time. An elegant dove on a bold background is the main focus of this design. 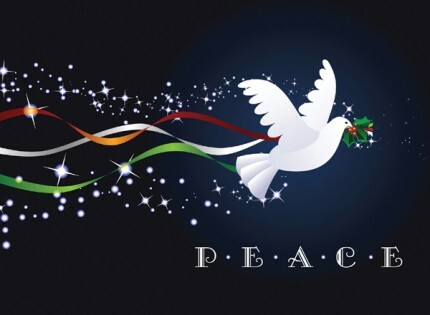 The word “Peace” is featured on the right hand side of the card in a contemporary font. Peace Soars is a traditional design with a gloss finish which is manufactured in the UK by Christmas Connections. CN0233 is suitable for corporate, company, business and personal use. Peace Soars is a perfect choice for all businessess.